This was another week of simply writing more conversations and debugging code. However, rather than leave it at that, I thought I would add a screenshot and talk about how altars will work in the game. I also thought I might use this as a start of a series of posts that touch on some of the gaming mechanics that will be available when playing. Subject to feedback, these mechanics may undergo minor alterations, but eventually will also be set aside as sections of the website ... when done. Altars play an important role in the world of Althéa and there are three types that can be interacted with: good, evil and neutral. It is possible for a PC of any alignment to offer a sacrifice at any of the different aligned altars, but there are obvious reasons why they would not. For instance, although all altars reward the sacrificing PC with bonus HPs according to the value of the sacrifice they make, the party's alignment is also altered in accordance with the altar sacrificed at. (No alignment alteration for neutral altars.) In some cases, a shift in alignment may be what the PC desires (to help rectify a previous alignment shift made in error, or to deliberately alter their allegiance), but for some (clerics and paladins), this kind of shift would come at a price of being cast into disfavour with their god. Therefore, the carefree fighter interacting with the altar simply to boost their HPs must think carefully before offering any sacrifice, as it could mean their fellow cleric will no longer be able to heal them. Note, the benefits for the sacrifice are given to the one making the sacrifice only, whereas alignment shifts affect the whole party simply because of the association with the one making the sacrifice. This will also help to reinforce character class associations and party relationships: no more evil clerics in the protection of a paladin ... or even a paladin being healed by the evil cleric in the party! Along with a temporary boost to HPs (which are permanent until lost) and alignment shifts, certain sacrifices will also boost experience points. The idea is to give the player good reasons to want to make sacrifices in the first place and these three potential game play aspects should help encourage the player to make note of where the nearest altar of their alignment choice can be found for future interaction. 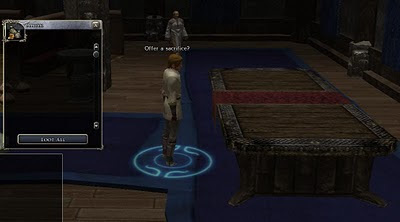 Mind you, the item used to reward experience points has many other uses, and so a player must once again weigh up the odds of sacrificing an item that may be of better use elsewhere. Not everything offered at an altar will be accepted. For instance, items of low value or those items deemed important pawn pieces in the unravelling of the fabric of time (plot items) will be rejected. I was also considering other specialised sacrifices, but that element remains unused at the moment and may be something I look into more at a later date, or for a later expansion of the the campaign. You can't go wrong including a screenshot. After all, its not the PCs non belief that matters, but the fact that there are gods who will respond to such behaviour. The thinking being that maybe the PC making the sacrifice will eventually be swayed to one alignment or another. So, the short answer is that (as it stands at the moment), any sacrifice will give a result regardless of the alignment or belief of the one making the sacrifice. And, of course, the results will (as you say) hopefully be an incentive and a reason to follow a deity.